While searching to find someone to showcase in our weekly #dkfeaturefriday on Instagram, we stumbled upon a spectacular video (below); a paddler in a Delta Kayak having the most graceful encounter with a Beluga in the wild—it was stunning! After a few exchanges and a handful of questions later, we not only came to know John King and his life on the east coast of Canada a lot better, we discovered he had far more to offer with experiences in his Delta than just a single video. Delta Kayaks: First, we’d love to know a little bit about yourself? John King: Of course, my name is John King, and I grew up in Gander, Newfoundland on the East coast of Canada. That is where I live now, and I‘m an Oceanic Air Traffic controller for NavCanada. DK: How long have you paddled for? JK: I have paddled for about 15 years. I have always been an outdoorsy person, but I didn’t spend much time around the north Atlantic, as we live in Central Newfoundland, the ocean at it’s closest point is still about 30 minutes away. DK: Have you always had an appreciation for the outdoors? 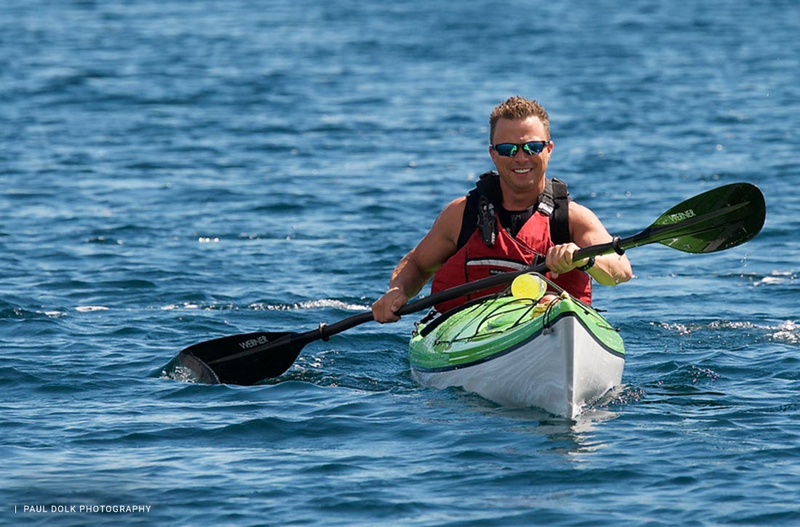 JK: I spent all my free time outdoors, and as I began kayaking I found freshwater to pale in comparison to sea kayaking. A selection of photos shared by John King, mostly taken with his GoPro. You can see more of his Newfoundland adventures in his Delta Kayak by checking out his Instagram account—give him a follow! DK: You’ve encountered Beluga’s, Humpbacks, Finback, Puffins and so on. What would you say is your favourite experience in your DK? JK: As for the Beluga, it isn’t my first encounter with Belugas and I always try to keep my distance, but the Belugas are so social they come to me. Often they spend the entire summer following fishermen and stealing part of their catch. Ironically, I truly believe that having a white bottom on my Delta has been attracting cetaceans because both the Beluga and the dolphins, as well as a pod of finbacks and several humpbacks, have really seemed to be curiously checking me out from below a lot more than before. DK: Tell us about your experiences paddling around Newfoundland; how do you know where to find the whales? In Newfoundland, during capelin season, it’s hard to go anywhere in the ocean without seeing some type of a whale. That said, whales such as belugas show up in our bays every year and it’s usually well publicized on social media. DK: Your videos have been featured on CBC Newfoundland. Did you know you’d captured something pretty spectacular when you had that encounter with the Beluga it was happening? JK: My original video that was captured by CBC (below) was actually an encounter with 2 finback whales and many many white-beaked dolphins. I did know at the time that people would enjoy the video, mainly because the conditions were perfect, no waves and clear water so you could easily see the dolphins as they passed beneath my Delta. DK: Any advice for other paddlers when out there with these big beasts of the sea? JK: If I was to give any advice to paddlers with regards to whales, it would be to watch from a distance, and not to be nervous. In almost all cases the whales will be just as curious as you are, and they’ll check you out. Although intimidating, I have had many encounters and have never had an occasion where I was in any fear, and that includes paddling with orcas several times. That may seem naïve, but as I said, respect them and they’ll respect you. I will say, one thing to be wary of is a feeding whale. That whale comes to Newfoundland because it needs to eat, and it needs to fatten up, so allow it to eat and don’t get in its way. Look at it this way, would you like someone getting between you and a great seafood meal after it has been placed in front of you on a plate? DK: Your Friend Paul Dolk is a photographer, and he’s taken some pretty rad pics of you out there. Were you expecting to find some more Beluga’s out there that day? JK: My friend Paul Dolk is professional photographer, has the most amazing marine life photography that I have ever seen, and has also had years of mind blowing experiences from his open boat here in Newfoundland. The day he took those photos of the beluga with his drone (included below), we were both quite amazed at how curious and inquisitive the beluga was. It wanted to be near my kayak and no matter where I went, it followed me, to the point that as I paddled back to my car, it followed the whole way. Paul Dolk is a good friend of John King’s and has captured these amazing encounters with John in his Delta 16 with some of the local residents of the ocean. You can find Paul on facebook or check out his website to view his amazing work! DK: Any close calls out there with the wildlife of Newfoundland? JK: I have encountered many types of marine life over the years, and I have only had my delta since this past summer, but I would have to say my experience with the beluga was pretty mind blowing. At one point the Beluga ” stood tall” completely out of the water and looked me right in the eye. It was remarkable. I had to be careful not to touch the beluga which was difficult because the beluga was actually pushing my kayak and placing its head between my hand and the paddle like a puppy dog. DK:We’ve seen some close calls with Paddlers and whales in videos online before. JK: I have never had what I would consider a close call with any type of marine life, mainly because I have complete trust in the whales – if you respect them, they will respect you. Kayaks are silent, unobtrusive, and whales are the masters of their domain. I also always tap my boat when in an area of whales in order to give them an idea of where I am. They know you are there, they are very maneuverable and they can turn on a dime….and kayaks cannot possibly hurt a whale in any way. One thing that is very apparent to me is that most of the whales I see display signs of contact with boats, whether it be the propeller marks or the keel slices…and I can rest easy knowing that I cannot paddle anywhere near fast enough to surprise a whale, nor can I collide with a whale in any way to cause harm. DK: Tell us a bit about your Delta Kayak? JK: It is a Delta 16, and I fell in love with it the second I got into it. DK: When and Where did you get your Delta Kayak? JK: I had been paddling a Necky kayak all these years, and I also own a Valley, but I wanted a new boat. 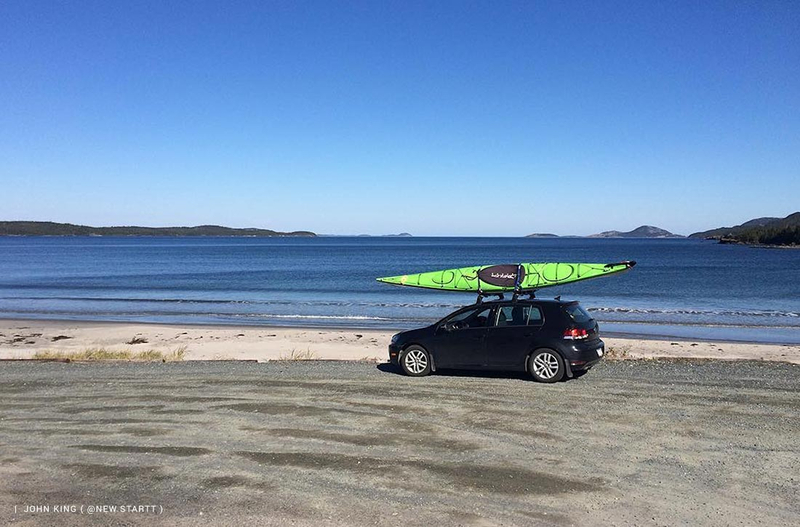 Here in Newfoundland we have a limited selection so just two months ago I drove to Halifax, Nova Scotia for the purpose of buying a new kayak, where I found one in a little picturesque town called ” Waverley,” at a store called Old Creel Kayaks. I actually drove 22 hours to Halifax ( it involves an 8 hour ferry ride to get off the island of Newfoundland,) to find my boat in a small place that I had never heard of. Had I known it was going to be as good as it is, I would have done it long ago. The irony is that subsequently I was talking with Jon Earle, a good friend of mine and the owner of The Outfitters, which is basically the only place you can buy kayaks here in Newfoundland, and he told me that they recently started carrying Delta Kayaks…so I could have possibly gotten it 3 hours away instead of making the 22 hour trek! DK: What made you buy a Delta Kayak? JK:The type of plastic that it’s made out of makes it feel like you’re gliding through the water with a lot more ease than the bulkier plastic boats, and has an overall feel of a fibreglass boat but is much more robust. The storage hatches are second to none, I myself have never seen hatches that were easier to use, more watertight or as roomy as the ones on my Delta. I am ecstatic with the boat! In addition to these things, I find the Rudder system very good, as the rudder ” pivots” rather than pushes in. That said, I rarely use the rudder, as the boat tracks perfectly without it, but it sure is nice to have a rudder at the end of the day after paddling for 8 hours with tired muscles—deploy the rudder and forget about corrective strokes. I personally have [another] boat with a skeg, but can’t for the life of me see why anybody would prefer a skeg over a rudder. DK: What is your favourite feature of your Delta Kayak? JK: As for the boat itself, it has everything and more that I wanted in a boat. First of all, it is a LOT lighter than previous, traditional plastic boats. It has the same chine as my last boat, so it was a good fit for me, but it has about 50% more storage, with the day hatch in front and more accessible than my previous boat. The seating system is really simple, easy to use, and you can even adjust it from inside the boat without having to get out. As I said, there’s very little the makers of Delta didn’t think of with its design. I’ve also paddled in extreme conditions with waves coming from all sides, and would MUCH prefer being in that situation with a rudder as opposed to a skeg. DK: What other accessories to you have? JK: [ I bought ] a Delta Spray Skirt , and a Delta Cockpit Cover. I have a Repair Kit and the Contour Hip Pad Fit Kit as well which I forgot about because I haven’t used them yet, lol. DK: What’s the one thing you can’t be without on the water? JK: It’s hard to pick just one thing to be without while on the water, because I never leave without ALL my gear, because guaranteed it’s when I leave it behind when I will really need it. JK: As for Camera equipment, I have 2 GoPros, a Nikon waterproof camera and a small sony point and click camera. I don’t profess to be much of a photographer, but I can aim a camera and see really cool things while kayaking, so it’s nice to capture them for others to experience. DK: You mentioned to us you just recently did a seal entry in your new Delta – what was that like? JK: The only worry I had with the Delta was how strong it would be with regards to getting beat up on our jagged beaches and pointy rocks here in Newfoundland. I do admit to being a lot more careful with this boat than I was with my last, but while on a beach of round rocks I did a seal launch from about 25 feet away from the water and it was perfect. No rubs, no holes, and perfect control. DK: Did the fact that Delta Kayaks are Canadian made factor in your decision at all? JK: Yes, the fact that it was a Canadian company definitely factored in when buying the kayak, and the first thing I did was buy a big Canadian flag which is attached to my rudder wire where it stays year round. DK: Say you had a Delta Bucket list: Where would you take your kayak next? Great article, enjoyed reading it! Thanks. Jealous of your experiences! Thanks for sharing your stories and the awesome pics.